Experience Matters: Mid Staffordshire - why was nobody listening to the patients? Mid Staffordshire - why was nobody listening to the patients? There are so many ways in which the disaster at Mid Staffordshire hospital should - and must - lead to improvements in patient care, not just locally but across the entire system of the NHS. Whilst politicians and the Department of Health have been quick to claim that it is just an isolated example, the reality is that it reveals an almost total inability of the national monitoring and safety systems to protect the patients who were admitted to the Mid Staffordshire hospital. 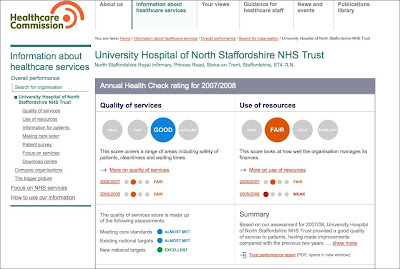 The facts are as clear as they are shocking: analysing mortality data for Mid Staffordshire Hospital reveals excess mortality since 2003, yet in the six years since then the Health Care Commission increased the rating for the hospital from Fair to Good and the hospital was given Foundation status - supposedly a marker of excellence in which patients can have complete trust. To make matters worse, the company monitoring outcomes data only "raised the alarm" in 2007, after they were alerted and asked to look in detail at the mortality information. This would be analogous to an organisation responsible for ensuring airline safety "alerting" the public to problems years after a plane crash that killed 400 people. So what lessons can be learnt, what changes have to be put in place to ensure that we don't have yet another "one-off" in a few years time, and what role does patient experience have to play in this? Most importantly, everybody working in healthcare has to listen intently and continuously to the patients. If patient-centric care means anything, and is to be more than just a politically correct buzz-word, it means continuous, detailed and open listening to the voices, experiences and opinion of patients. Patients, their families and carers in Staffordshire had been complaining loudly from 2003 about the shocking state of their hospital and their voices were ignored completely. The Trust itself appears to have dismissed them, and the Healthcare Commission has no system to track and monitor the level of complaints made about a hospital - until the patients themselves complains to the HCC. There is extensive evidence that the perceptions of patients and their experience is an accurate marker of quality standards in hospitals - yet the NHS does not harness what is probably the most accurate, early system of detecting poor quality healthcare: the voices of those using the service. One can only speculate how many lives would have been saved if the NHS systematically incorporated real-time collection and monitoring of patient experience as part of safety and monitoring systems. Rather than listen in real-time to the public, the HCC requires patients to be dead before their "experience" activates the systems and alerts. One doesn't need medical training to realise that this might be somewhat too late! However, not only is this a patently ridiculous way to protect patients (akin to a smoke-detector that only goes off months after the house has burnt to the ground), but it also lacks the sensitivity necessary to improve quality across the NHS. As anyone who has worked in a hospital will tell you, things can be very bad indeed before mortality rates increase. The experience of patients has to be a metric and tool that the board and management of Trusts use in the same way that they use data about infection rates: a critical, sensitive and core metric of quality. Perhaps then we might actually get closer to a truly patient-centric NHS.